April Session – Registration is open! The next session of classes starts April 1st! We have several new class topics this session, register before March 17th to get the early bird price and save $25! Personal attention is the focus of this class. Registrations will be limited so that each person can benefit from individual time with the teachers throughout the session. The content of the class will be decided on based on the needs of the participants. If you want to slow down the rhythm and spend more time on tricky topics before moving on to the next level, this class is for you. Or maybe you missed several classes last session, or you prefer the small group dynamic. This might be the place you want to be! Cat’s Corner invites you to a unique world tour of swing dances. Every hour, from 8 p.m. to 1 a.m., a different country will be highlighted. You will discover a new point of view on swing, its local history and its specific cultural development. Performances and lessons every hour! FREE event. No reservation required. Just bring a pair of clean shoes! Welcome to the Downtown Stomp (DTS), Cat’s Corner’s social swing dance night! Along with a full night of social dancing every Friday, two lessons are offered each week. the admission price is $15 (cash only). 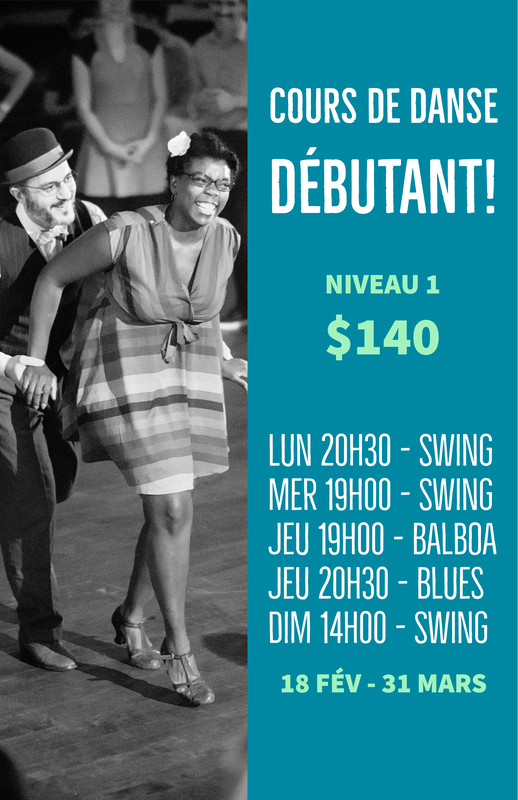 Take the beginner swing lesson at 8:30pm for your first taste of swing or to brush up on your basics. We also offer an intermediate swing lesson at 8:45pm for dancers who have been dancing at least a couple months, with new content each lesson. Social dancing starts at 9:30pm and the bands first set will begin at 10PM. No reservation, experience or partner required. Drop-in and come have fun! We ask that you bring a clean and dry pair of shoes for dancing. Join us for a monthly Tap Jam with the incredible Majiza Philip! What is a tap jam? Its a chance to practice your improvised tap dance. All levels are welcome! Our beginner classes are starting the 18th of February! Do you want to offer swing lessons as a gift? It’s now possible! To ask for our gift certificates of the value you need, write to info@catscorner.ca or call 514-8-RHYTHM (514-874-9846). Come try swing dancing every Friday night at Cat’s Corner. Join us Friday for our Downtown Stomp dance! Try our beginner lesson at 8:30 pm or our intermediate lesson at 8:45 pm. Social dancing from 9:30 pm – 1 am, all for $10! 9:30 – 1am Social dancing to swing music for everyone! 2 rooms for dancing, one with faster tempos. all swing! 2 rooms for dancing, one with groovy blues music! Want to hear what kind of music we groove to? Check out our Spotify account for a selection of tunes by our talented DJs! Click here to find our musical resources page, containing playlists and information about swing musicians, old and new. Interested in classes? See our schedule or visit our registration page.